Twitter is giving users what it thinks is a safer way to handle shared access to an account without compromising the login. Users of TweetDeck, the popular dashboard system for the site, will be able to share access to Twitter accounts without sharing passwords. That adds a useful layer of security for businesses that use Twitter, by eliminating the need to disseminate passwords among employees. Some high-profile Twitter accounts like those belonging to Newsweek magazine and the U.S. military’s Central Command have been hacked in recent months. Shared passwords are an obvious weak point for corporate social media accounts, as they increase the likelihood of unauthorized access. The new TweetDeck feature, called Teams, lets the person who currently manages the account identify others as contributors or administrators. Those people can access and tweet from the account on TweetDeck, but they don’t need the account’s password to do so. 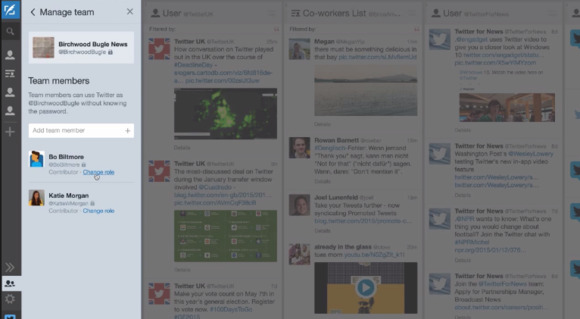 The feature is rolling out starting Tuesday on TweetDeck for web, Chrome and Windows, Twitter said. With the tool, the person who already has access to the Twitter account signs in to TweetDeck using the account’s regular credentials. From the navigation bar, the person can type in the Twitter handle of other people to give them access. Both administrators and contributors can tweet from the account and follow and unfollow others, but only administrators can add or remove team members and view the team. Users who are already sharing their account can change the password and revoke app access if they prefer to use the new feature, Twitter said. The company is encouraging users to continue using two-factor authentication, which has a code sent to their mobile device upon login, because it acts as yet another check against unauthorized access. Twitter did not reveal plans for bringing the feature to Twitter.com or Twitter’s mobile apps.